I wrote in another post how to cleanup a tub using only baking soda and vinegar. This was after we had a plumber come to our house to handle a very clogged drain. We live in an old building, and the plumber said the clog he found was about 24 feet into the pipe, something that existed long before we stumbled into that bathroom. However, since I have pretty long hair, I've been dealing with clogged drains for a while now, and I've never been a fan of the nasty chemical options. I was actually really pleased when my landlord explicitly asked us to not use harsh chemicals, as they can damage the older piping in the unit! 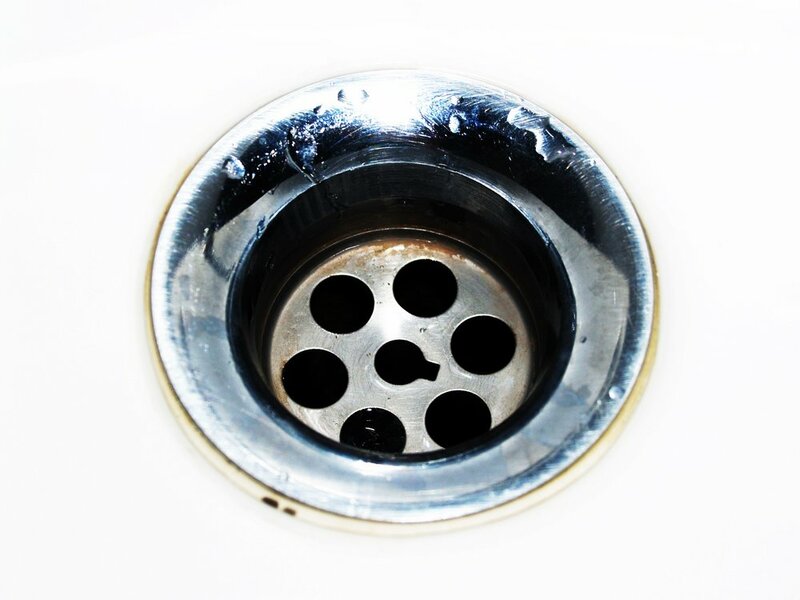 Sometimes clogs are just some hair and other gunk lying right below the surface of the drain. You can use a screw driver to remove your drain cover (depending on the type of cover) and sometimes you can snag the hair caught in the drain and pull it out from the top. Sometimes there's just a little bit of hair, sometimes you will pull out a whole mess of it. It really depends on how protected your drain has been. Fill a teakettle, or large saucepan, with at least 3 cups of water and bring to a boil. Pour the boiling water directly into the drain. If you need to just do a little bit at a time to allow the liquid to work its way though the clog, do so. The temperature of the water will help breakup the blockage. It can take multiple tries with this one, so don't be afraid to use more water, or do it a couple times. NOTE: If you live in a place where PVC pipes may be a part of your plumbing, definitely let the water cool to about 158ºF/ 79ºC before dumping it down the drain. PVC pipes are generally considered unfit for plumbing, but depending on where you live, or if anyone may have maybe made some not-so-to-code alterations to your home, you may have some w/o realizing it. If you're unsure, play it safe and let the water cool a bit! Mix equal parts baking soda and vinegar in a measuring up, about 1/3 cup of each should be good. As soon as it starts to fiz, pour it down the drain. Sometimes I actually put the baking soda directly into the drain and pour the vinegar in on top of it. Either way, cover the drain and let it sit for 15-30 minutes. A drain auger (or drain snake) is a long metal rope with a spiral on the end. Manual ones usually have a handle to twist with at the end. You place the spiral end of the rope into the drain and twist until you reach the blockage (where you should feel resistance) then you twist to hook the clog and pull it out. Manual drain augers are relatively inexpensive, can found at your local hardware store, and can be a good solution for a stubborn clog. However, if your clog is very deep and potentially due to rusty pipes, you will want to call a plumber who will most likely use an automatic auger, which has much more power and length behind it. Though it's very satisfying to finally watch water move down your drain after potentially fighting a clog for weeks, the best way to handle clogs is to prevent them in the first place. The best way to do this, confirmed by our very kind plumber, is to get a hair trap. Even if you have a drain that includes one, I'd get another to go on top of it. You can also use the above methods (hot water, vinegar & baking soda) as general drain maintenance. Every few months you can dump some hot water down and do a baking soda/vinegar fizz to keep the drain in good working order.